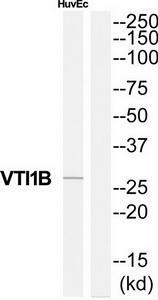 VTI1B MaxPab polyclonal antibody. Western Blot analysis of VTI1B expression in human kidney. 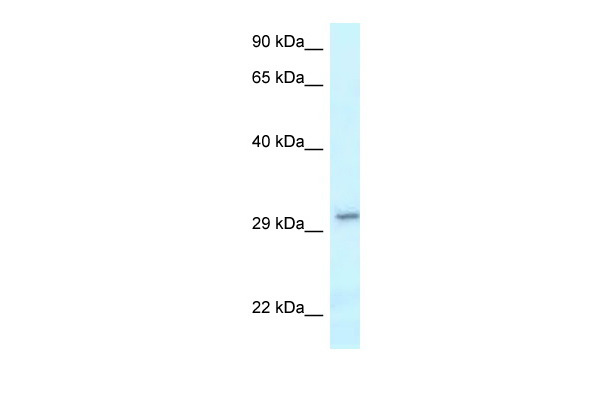 Western Blot analysis of VTI1B expression in transfected 293T cell line (H00010490-T01) by VTI1B MaxPab polyclonal antibody.Lane 1: VTI1B transfected lysate(25.63 KDa).Lane 2: Non-transfected lysate. VTI1B polyclonal antibody ( Cat # PAB7012 ) ( 1 µg/ml ) staining of human duodenum lysate ( 35 µg protein in RIPA buffer ) . Primary incubation was 1 hour. Detected by chemiluminescence. TA303102 (1µg/ml) staining of Human Duodenum lysate (35µg protein in RIPA buffer). Primary incubation was 1 hour. Detected by chemiluminescence. Western blot analysis of extracts from HuvEc cells, using VTI1B antibody.The lane on the right is treated with the synthesized peptide. 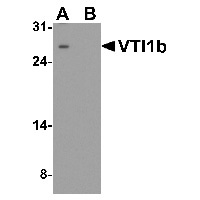 Western blot analysis of VTI1b in HeLa cell lysate with VTI1b antibody at 1 ug/mL in (A) the absence and (B) the presence of blocking peptide.